Bring a large pot of salted water to a boil. Add the ravioli and cook as the label directs. Reserve 1/2 cup of the cooking water, then drain the ravioli. 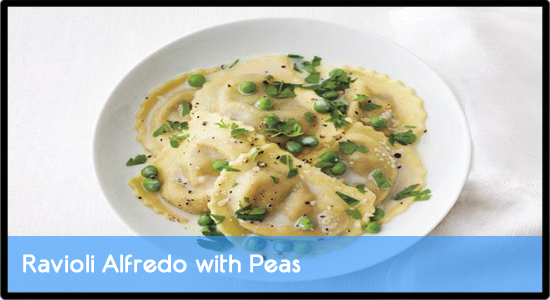 Combine the butter, cream and peas in a large skillet and bring to a simmer over medium heat; cook 1 minute. Add the ravioli, cheese, nutmeg and a splash of the reserved cooking water to the skillet and toss. Add more cooking water to thin the sauce, if needed. Season with salt and pepper. Divide among bowls and top with the parsley.